Many worry that student loans are a drag on the economy, particularly the housing market. Analyses from the Federal Reserve Bank of New York, cited by leading economists, do not provide compelling evidence for this hypothesis. The New York Fed data contain no information about education. As a result, their analyses contrast the home ownership rate of student borrowers with that of an inappropriate comparison group: those who attended college debt-free and those who never went to college. More complete data from researchers at the Board of Governors of the Federal Reserve System reveal a different story. The striking gap in homeownership is not between college-educated people who did and did not borrow, but between those with and without a college education. There is widespread concern that student loans are a drag on the housing market. Leading economic thinkers, including Larry Summers and Joe Stiglitz, have linked the slowdown in homeownership among young people to high levels of student debt. [i] They recommend easing loan burdens to keep student debt from acting as a brake on the economy. 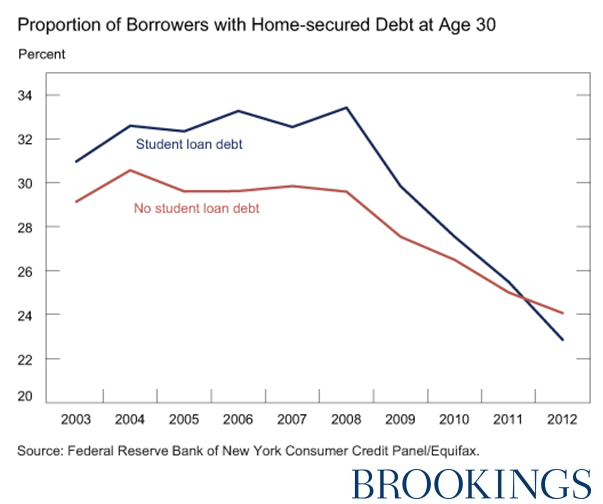 But is student debt really hampering the housing recovery? Many read into this graph that student debt is dragging down the housing investments of the college-educated, making them worse off than those who went to college and did not borrow. 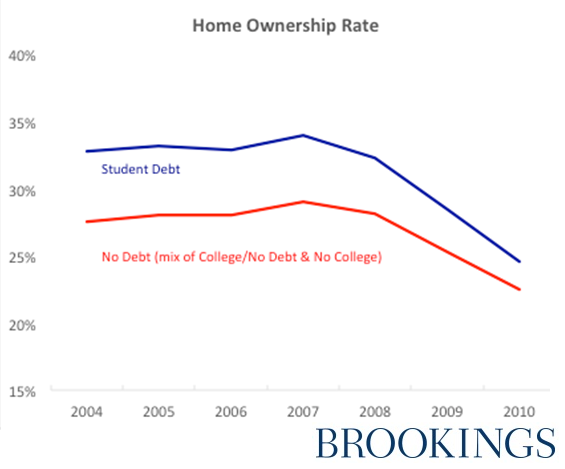 But this graph and its underlying data do not (and cannot) show that debt is decreasing home ownership among the college-educated. Why not? These data contains zero information about education. Lumped together in the “No student loan debt” group are a) people who went to college yet did not borrow and b) people who never went to college. The composition of both of these groups is changing over time. This odd comparison reflects the limitations of the data on which it is based: credit reports. Credit reports do contain detailed information about debt, including student loans, mortgages, credit cards and car loans. But they say little about the borrower herself. In particular, they include zero information about education. What we therefore can’t do with the credit reports: compare the homeownership rates of those who a) did not attend college, b) attended college and borrowed, and c) attended college but did not borrow. Researchers at the Board of Governors of the Federal Reserve System (Alvaro Mezza, Kamila Sommer and Shane Sherlund) pulled together the data needed for precisely this comparison. The researchers combined credit reports with data on college attendance from the National Student Clearinghouse (NSC). These NSC data are nearly a national census of college attendance and are used extensively by researchers. [v] The NSC data include college enrollment information for all college students, not just those who borrow. The Board first replicates the NY Fed results, to show that its data are comparable. The figure below replicates the New York Fed graph through 2010, when the Board data for this article end. The dark-blue line plots the homeownership rates of those who hold student debt and who by definition must have gone to college. As in the New York Fed data, the no-debt group (red) is a time-varying mash-up of those who did not go to college and those who went to college debt-free. We see here the same pattern as the New York Fed data: the homeownership rate of borrowers drops faster during the recession, converging with that of non-borrowers. The next graph does what the New York Fed could not do: break the no-student-debt group (red) into those who went to college (light blue) and did not go to college (black). While the take-home from the previous graph was the convergence in homeownership rates between those with and without student debt, the most striking pattern in this graph is the massive gap in homeownership between those who do and do not go to college. What divides the haves and have-nots is not student debt. It’s having a college education. Before the recession, 35 percent of young people with a college education and no student debt owned a home, while only 23 percent of those without a college education owned a home. With the recession, homeownership dropped in both groups. Homeownership did drop faster for those with a college education but it started from a much higher base. By 2010, 26 percent of those with a college education (and no student debt) owned a home, compared to 17 percent of those without a college education. The next graph delves deeper into the data, tracking how homeownership rates evolve over the life cycle. 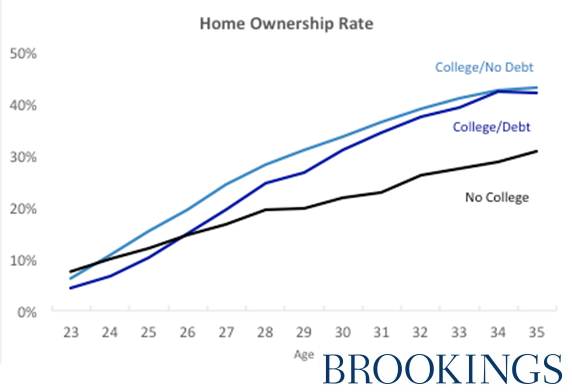 When people are in their early twenties, those who did not attend college (black line) are most likely to own a home. Why? They have been working since high school and are beginning to settle down. Their college-educated counterparts are just entering the labor force. The college-educated catch up fast, though, and have higher rates of home ownership by age 27. By age 35, the gap in homeownership between those with and without a college education is about 14 percentage points. 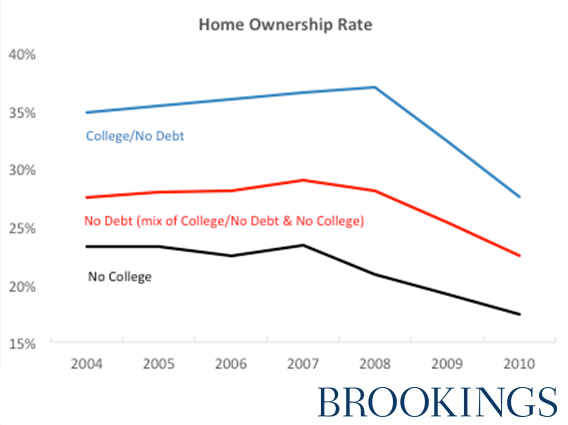 Those who borrow for college (dark blue) do have a slower start to homeownership than those who went to college debt-free (light blue). This makes sense: loan payments add to the monthly debt-to-income ratio that determines eligibility for a mortgage. But by the time people are in their thirties, when the typical borrower would have finished paying off her student loans, the home ownership rates of the two college-educated groups are statistically indistinguishable. The striking, large gap is between the college-educated and those who stopped with high school. The typical undergraduate borrower with a BA has a debt of $30,000 and owes $350 a month, or just $4,200 a year. This burden of student debt is dwarfed by the differences in earnings between those with and without a college education. These simple graphs are by no means the final word on understanding the effect of student debt on home ownership. [ix] I show them because simple visuals can deliver a powerful message. Indeed, the deeply misleading graphs from the New York Federal Reserve have influenced the views of key economic thinkers and the public at large. The newer data also deliver a powerful, visual message: the college-educated—even those with student debt—are winners in our economy. [ii] https://www.federalreserve.gov/econresdata/notes/feds-notes/2014/student-loans-and-homeownership-trends-20141015.html In all analyses of credit record data, having a mortgage proxies for owning a home. [ix] Several research teams have applied more sophisticated statistical methods to detailed survey data (see here, here and here) in attempts to address this question. Isolating the effect of student debt on any financial decision is challenging, since the same variables that lead someone to borrow for college also influence the likelihood they will buy a home. This biases simple comparisons of those who do and do not borrow for college. For example, students who do not borrow for college may have wealthy parents who can later provide a down payment for a home. This would lead us to over-estimate any negative effect of student debt on home ownership. Other omitted variables could produce bias of the opposite sign.